Some key parts of Kibuye Hope Hospital are less obvious than others. Cleaning, purchasing, lab testing, accounting, and so many other tasks are vital for a hospital to work well, but can be a bit hidden. 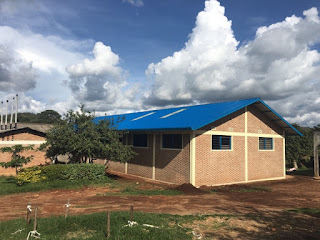 Kibuye is about to open our new pharmacy building - a huge improvement to one of these critical support services. As KHH has grown over the past decades, the pharmacy function has grown, spread out, and moved around. There have been multiple small pharmacy locations, scattered around various buildings. It makes it hard to manage, hard to staff, and confusing and frustrating for patients. Our receiving and storage are done in places that are cause the tasks to be time-consuming and difficult.